Kids will have fun celebrating Independence Day with these creative and FUN 4th of July Crafts and activities for kids of all ages! Get ready for an epic independence day with kids as you celebrate by making these 4th of July Crafts for kids of all ages. 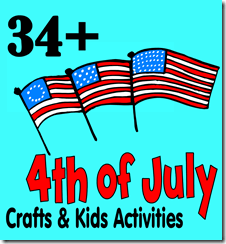 There are tons of great fourth of july activities for toddler, preschool, kindergarten, elementary age kids! Your hardest part is deciding which one to try first!